I have been a part of the Shorinjiryu Kenryukan family since I was 8 years old. My father (Kyoshi Brian) had the honor and privilege of studying Shorinjiryu with Masayoshi Kori Hisataka in Japan. 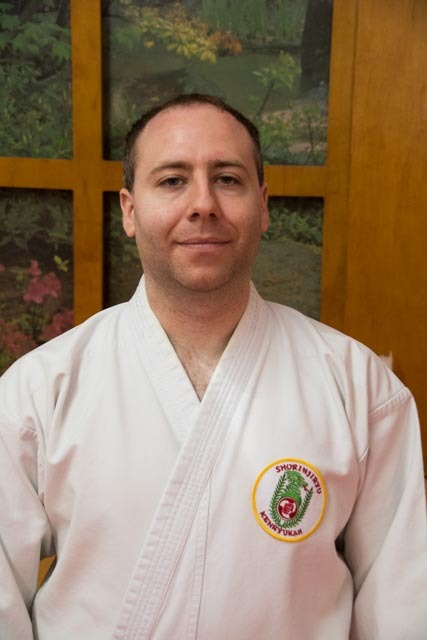 After returning to the United States at the end of his tenure with the US Airforce, Kyoshi Brian started a Dojo in Edison, NJ at the Stelton Community Center. After approximately 25+ years of practicing Shorinjiryu Kenryukan, I am now officially the chief Instructor (4th Dan) of the Stelton Dojo. I was originally drawn to the martial arts like most children through a variety of movies and television shows. There were many martial art styles on display such as aikido, judo, karate, muy thai, to name a few. That initial curiosity and overall coolness factor triggered me to start taking classes at my father’s Dojo. There was an initial sense of confusion from my end when I started because the first karate activity for every class was 400 jumping jacks. This bewilderment stemmed from my naive thinking that we would first be learning flying jump kicks and using lethal techniques where only one finger was needed. I strongly believe that most children today still have this simplistic outlook on karate and that is the reason why so many beginners do not make it past 1 week’s worth of classes. Fortunately for me, I actually enjoyed all of the repetition and various warmup exercises required just to prepare the body for learning Shorinjiryu techniques. As I grew up in the Dojo, I started to get a better grasp of what Shorinjryu was all about. As an electrical engineer, I had always wanted to learn how things worked underneath the surface and for Karate this idea was no different. Anyone can throw a punch but to understand the smaller details such as the position of the feet or the way to breathe during the technique were things that really drew me into the style. Our style has a published book titled “Scientific Karatedo” and the core essence of Shorinjiryu can be summarized into those words. We do not teach techniques that have no real world application (aka the spinning flying jump kicks or the flashy baton twirling) as seen in Hollywood. The Kenryukan also understands the need to branch out and to incorporate aspects from other martial arts to fill in the gaps required especially for various self defense applications. In my opinion the most important lesson that can be learned from Shorinjiryu comes from our motto “Spiritual development of mind and body”. There are many different kinds of students: tall, short, older, or younger and all of these traits lead to a unique individual. In other words, what works for you might not work for me. For example, in Shiai there may be one competitor who is short but is very fast while the other competitor is taller but slower. The taller fighter generally wants to fight from the outside where he or she can utilize kicks for covering long distances. The shorter fighter would ideally try to use his or her speed to get close and fight from the inside where shorter techniques such as punches and elbows can be utilized. 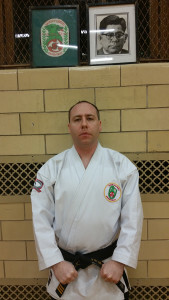 Furthermore, these qualities also lead to variations in techniques during kata demonstrations which can be witnessed at any Shorinjiryu tournament. My favorite definition of a black belt has always been a white belt who never quits. The various Shorinjiryu schools around the world reinforce the idea that our style can be catered for any age and ability. I know that I will always be a part of the Shorinjiryu family and am looking forward to continue my training for years to come.